I’ve eaten eggs benedict twice in my life. The first time was 15 years ago. The second was today. Back in the year 2000, I flew up to Chicago with my sophomore-year girlfriend to spend more time with her before heading home for the summer. During the trip, I went out to brunch with her family, and they all raved about the eggs benedict at the restaurant (I don’t remember the name, but it looked like a house, and it was near New Trier). I was 19 at the time, and I had never eaten eggs benedict. I wasn’t even quite sure what it was, but it sounded so decadent. I was raised in a frugal middle-class household, and I had the perception that eggs benedict was for kings and queens. But with the family’s invitation, I tried the dish…and wow was it delicious. I had never eaten anything like it. Despite the experience, I continued to perceive the dish as rich and opulent, so I never ordered it again. I can’t really explain why–it just never happened. 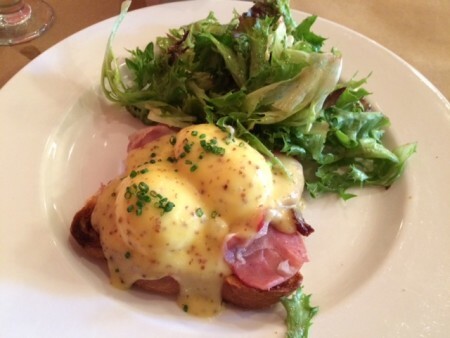 Fast forward to a few days ago–over 15 years after my original eggs benedict experience–when I got an e-mail from a friend inviting me to get eggs benedicts with her over Sunday brunch. The invitation intrigued me because it wasn’t a generic brunch invitation–it was specifically for eating eggs benedicts. Of course I accepted. When I sat down to eat at Brasserie by Niche this morning, my friend revealed that she was somewhat of an eggs benedict connoisseur. She’s traveled all over the world (and St. Louis), and wherever she goes, she tries the dish. She said the second best one she’s had was in Barcelona…but the best was at Brasserie, where we were sitting. As far as I can tell, she was right (see photo). The dish was worth the 15-year wait. The brioche bread was crispy and light, the ham layered to perfection (not too salty), the eggs fluffy and perfect, and the hollandaise sauce creamy and delicious. The whole dish was amazing, and I’ll be thinking about it for quite some time. Hopefully I won’t wait 15 years to order it again. Have you ever had eggs benedict? If so, what’s the best one you’ve ever eaten? This entry was posted on Sunday, June 14th, 2015 at 11:54 pm	and is filed under food, restaurants, St. Louis and tagged with restaurants, St. Louis. You can follow any responses to this entry through the RSS 2.0 feed. Now, that looks delicious. I have Eggs Benedict once every few months. Opulent is certainly an apt description; although it’s actually not particularly expensive dish, at least not where I’m from. After seeing this article, all I can think about is Eggs Benedict! You’re living the high life, Allen! I’m sure it’s a misperception on my part, as it’s not a particularly expensive dish here either. I was at a pretty fancy restaurant yesterday, and it was only $11. The Bang Bang Shrimp Eggs Benedict at Bonefish Grill is Amazing!! Best I’ve ever had but like you I have only had eggs benedict a few times in my life. They also make a traditional eggs benedict, spinach+mushroom eggs benedict, and a surf+turf eggs benedict. Awesome! What is the “bang bang” portion of the recipe? It is their signature sauce. The Bang Bang shrimp is their top selling appetizer dish. They have since integrated it into other things on the menu. They also have bang bang shrimp tacos, a hamburger with bang bang shrimp on it, etc. I love the sauce therefore love all the dishes mentioned. Those all sound really good! The first was at a Vineyard where I stayed in Blenheim, New Zealand. We sat on a patio overlooking vines and mountains and ate Eggs Benedict. The catch was that they used a thick cut bacon instead of ham. So good. Adam: That’s neat that you also see it as a special treat. The thick-cut bacon sounds delicious! I definitely think it’s worth a try! I wonder if the Kitchen Sink has a version of it. I think the Kirchen Sink does have a version called “crab cake Bennie”. For my first eggs Benedict experience, I think I’d want a traditional version. This is one of my many favorites. I go to The Original Pancake House for my fix. I usually order The Garden Benedict when I’m there since I prefer no ham or bacon. However, that sauce on your dish looks amazing. I need to get my little heinie over there to try it out even with the ham. I guess there will Eggs Benedict for Christmas. Yum! Thanks Mom. I look forward to trying your version of this special dish. I can’t believe you’re just reading this for the first time. 🙂 It was a very memorable eggs benedict!